Working with Cool Webing Mobile Apps and Web Design, and in collaboration with UNE’s curator, Ian Stephenson and regional communications advocate, Alun Davies, they set out to show what could be done with apps for small museums. … the app is a powerful tool in attracting visitors and enhancing their experience. 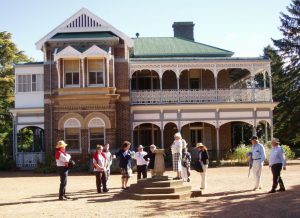 At this year’s March meeting of the New England Northwest Chapter of Museums Australia, Saumarez Homestead presented the workshop: “Appenings! Enhancing the visual presence of small museums” which led to the development of the Saumarez Homestead app prototype. Launched in May, the app is a powerful tool in attracting visitors and enhancing their experience. They can book tours, find out about the history of Saumarez, see the café menu, as well as view pictures of the homestead, gardens and farm area. The app lists events, workshops and public programs. The built-in QR scanner allows visitors to get additional information about displays and features of the property by scanning the codes attached near collection items and various locations within the Homestead. Function organisers and brides-to-be can book venues online for their special event. Visitors can share their ideas, make comments and provide feedback by clicking the ‘fan wall’ tab. Users can connect to the Saumarez Homestead Facebook page and read what people say about their experiences as well as share their own. The app is designed so that Global Positioning System (GPS) capability provides directions for visitors and registers when they arrive, and has the potential to offer return visitors free booklets, CDs and DVDs as rewards using the built-in GPS coupon. Cool Webing is a social technology enterprise based in Armidale. Through their generosity the Saumarez app was developed pro bono, costing $1000 to register the app on the Android and iOS platforms. Cool Webing is keen to provide the latest ICT technologies to help community organisations achieve their objectives. The $59 per month for hosting includes support, maintenance and analytics about user activity. Access to a powerful dashboard allows Les and staff to make changes and updates instantly. 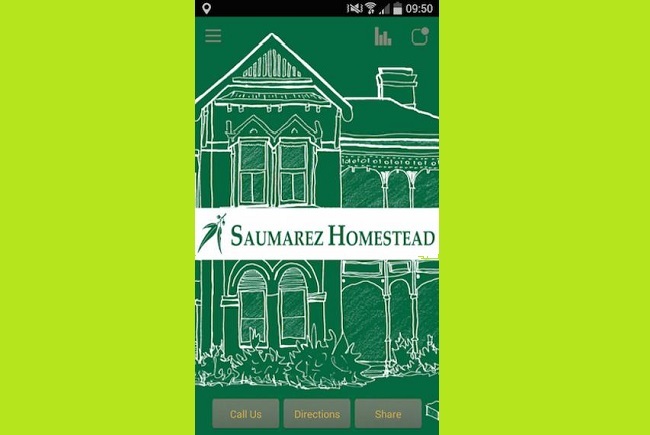 If your organisation wants to broaden the demographic of your audience customers, in particular those using Smartphones and tablets, download the Saumarez Homestead app and see for yourself.